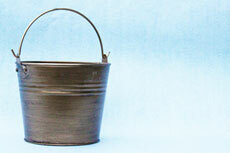 What is electro galvanized metal? 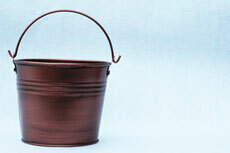 Largest selection of color metal buckets that are durable, long lasting, scratch resistant and Our full selection of metal pails includes 48 different sizes and solid colors. Find favorite colors of metal buckets, pails and tubs to give a gift, organize clutter in your home, keep beverages cold or to decorate for the spirit of any season. Eat your heart out DIY imaginations. 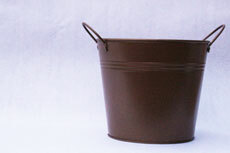 Some of these buckets, tubs and pails include a plastic water-tight interior liner. 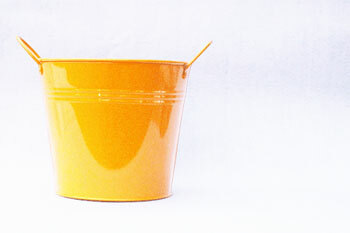 The 2, 5, 10 and 16 quart buckets have a steel metal body powder coated in 14 bright colors. Made in Ohio, USA. 1. It is an electrostatically charged powder polymer applied by a special powder coating device (generally, a spray gun). 2. Powder must be cured or baked for about 10 minutes at 400 Fahrenheit to thermally bond powder the substrate steel. Oils, metal oxides from welding scales are removed. This cleans the steel bucket and will maximize bonding of the power to the steel, without a primer. There’s no better method to achieve such excellent coverage on the ins and outs of the corners than free flowing dry powder bonding electrostatically to charged steel. Can I feel good about buying powder coated steel products? • The magnetic process releases virtually zero volatile organic compounds and is thicker than liquid coatings. • The electro-adhesion process is energy efficient material handling and manufacturing. Read what SRI has to say. • Excess powder called overspray is easily recycled allowing for 100% use of coating material. • Application produces typically very even paint. • Chipping is prevented, thermal bonding is superior adhesion. 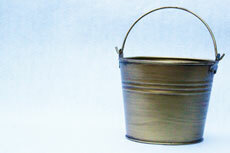 Enamel and powder coating are both methods of painting metal, they additionally provide corrosion protection. Enamel color paint is applied as a liquid; it is an older form of painting technology. It’s more energy intensive and it’s liquid chemical composition releases volatile organic compounds. It is a relatively sturdy coat of color that’ll last. Both choices are great techniques for decorating your bucket. The enameled finish is a high quality covering. However, the powder coating is thicker and will stand a greater amount of abuse than the enameled surface. Another consideration is price: Powder coated items are usually much higher in price than their enameled counterparts. If the container that you are buying is going to used as a candy container, then an enamel finish should be a durable enough coating. If the container will be used for work and is expected to look good, the powder coating is the correct choice.